If you’re in the market for a new hair straightener, the HSI Flat Iron is one of the best buys out there. Here, you’ll find our HSI Professional Flat Iron review and buyers’ guide. If you want to get the best price on the HSI Professional, click here to check out the official Amazon product page. Otherwise, keep on scrolling down to get right to our HSI Flat Iron review. If you’re like me, you have curly hair and like to use mousse to keep those curls looking fresh all day long. If you’re also like me, you like to straighten those curls every once and a while. That’s where HSI Professional comes in to make sure your hair not only looks good when it’s straight, but also that it remains healthy and protected against heat and damage. That’s because the HSI Professional 1 Ceramic Tourmaline Ionic Flat Iron hair straightener brings you the latest technology and protection for your hair every single time that you use it. HSI Professional Flat Iron: Why Buy It? For starters, the HSI Flat Iron uses eight heat-balance micro-sensors which evenly distribute the heat produced by both of the plates so that you don’t have to put your hair through it a dozen times to get that smooth and silky look and feel – one of the biggest time-saving advantages we found during our review of this hair straightener. I can’t tell you how many times my boyfriend or relative says to me, “it smells like burning hair!” Not anymore! The micro-sensors monitor how much heat is being distributed to your hair and adjust the temperature in order to lessen the damage. You can always tell just how hot your HSI Flat Iron is from the digital LCD output; the iron takes only seconds to heat up, to anywhere between 140 degrees to 450 degrees, and can be adjusted at will. The HSI Professional Flat Iron also contains a very unique feature. Its ceramic plates are coated with Tourmaline – a type of gem stone – which gives off negative ions when activated. The ions in the gemstones combined with the infrared technology heat the hair from inside to lock in moisture and fight off frizz and damage. If you don’t want to lose some of that curl mentioned earlier, the “floating” plates on the HSI Flat Iron have curved edges so you can flip or curl your hair at will. By adding “floating”, or flexible plates, HSI Professional protects your hair from any tension while it’s in between the heat. This flexibility allows your hair pass through without any snagging, breakage, or tugging. No girl likes it when you see strands of hair stuck in the straightener! Another awesome safety feature we discovered here at Respectable Reviews during our review is that the HSI hair straightener will automatically turn itself off after a certain period of time. I love that companies are now putting in this feature because sometimes when we ladies are rushing to get out the door for work, happy hour, or a date, it’s easy to forget to turn off the heat! 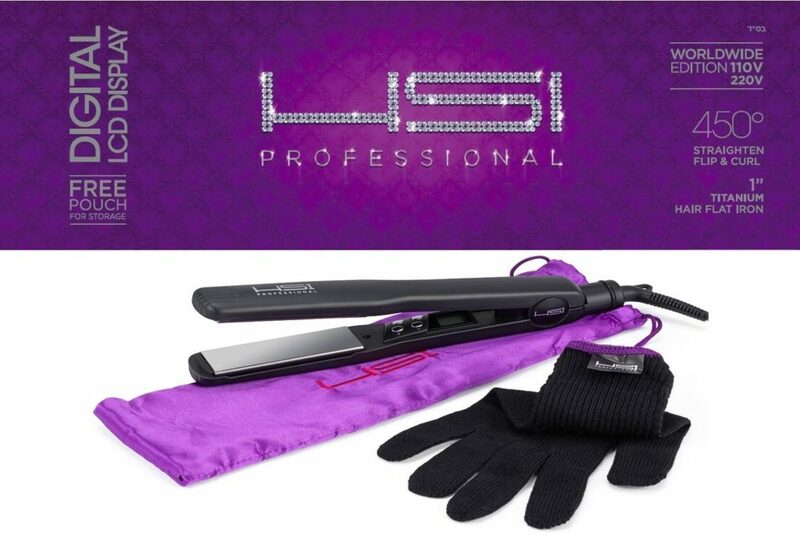 The HSI Flat Iron comes with a glove to protect your hand while you are using it. A protective pouch is also included with your purchase for convenient storage and transport. The pouch is insulated and traps the heat once inside to ensure that once you unplug it, so no harm is done to anyone who might accidentally pick it up while it’s cooling down. I have been using hair straighteners for years but haven’t come across one, like the HSI Flat Iron that not only guarantees your hair will look and feel like it’s been professionally done in a salon, but it also uses advanced technology to make sure your hair continues to look this way use after use without sacrificing your beautiful hair. I would hate to part with my current tried and true hair straightener, but the HSI Professional Flat Iron might actually be worth it!